Training dogs of any command or socialising them in the city with sounds, smells, people and all the chaos is not the same as getting your pup accustomed to the gunfire sound. 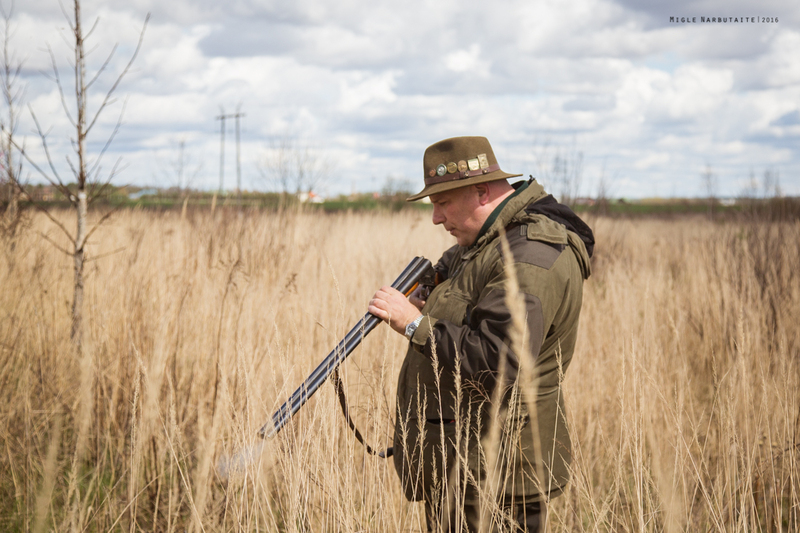 The sound of shooting is an active artificial intervention in the environment, so you have to do it step-by-step avoiding mistakes. Even the boldest pup in the litter might become gunfire shy if the introduction to the gunfire is not handled correctly. 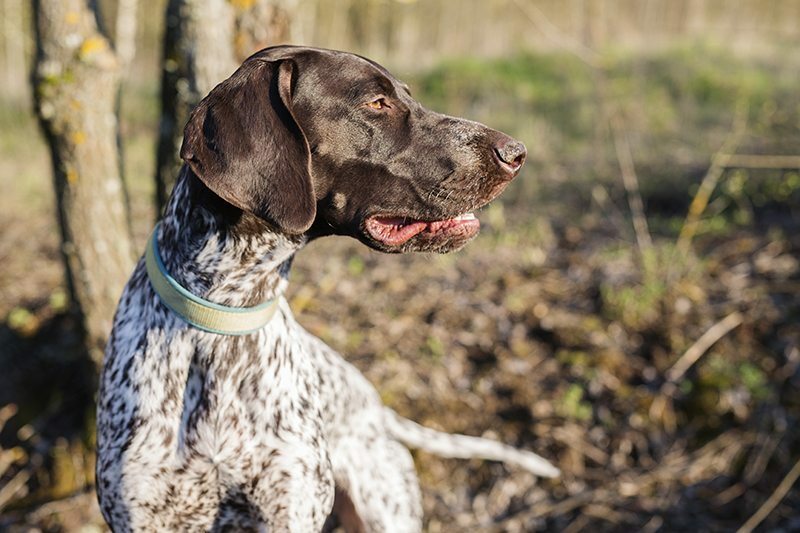 A shy dog is not what you want, especially if we speak about gun dogs. Is your dog scared of thunder? Is it scared of fireworks? Many dogs are afraid of thunder and many dogs are afraid of fireworks as well. I will not go into the details of why they are afraid, but will give you an actionable step-by-step plan how to help them. Don’t rush. The goal is to introduce the pup to the sounds with only positive associations and experience. It might be a long process taking time for acclimatization. Taking your dog through the right training process with no rush but knowingly and thoughtfully in advance, your pup will learn that sound of gunfire is a time for fun. I start training / socialising puppies to different sounds from very early days, just after they begin to walk. First sounds are regular household noises such as doors opening and closing, washing machines running, a radio going in the background from silent to loud, TV with going loud commercials, vacuum cleaner in the background, clapping hands and so on. Important to begin out quiet and build it up louder and louder. Observe the pups all the time. Their reaction will guide you. When they are comfortable with sound, you can come closer or make it louder. 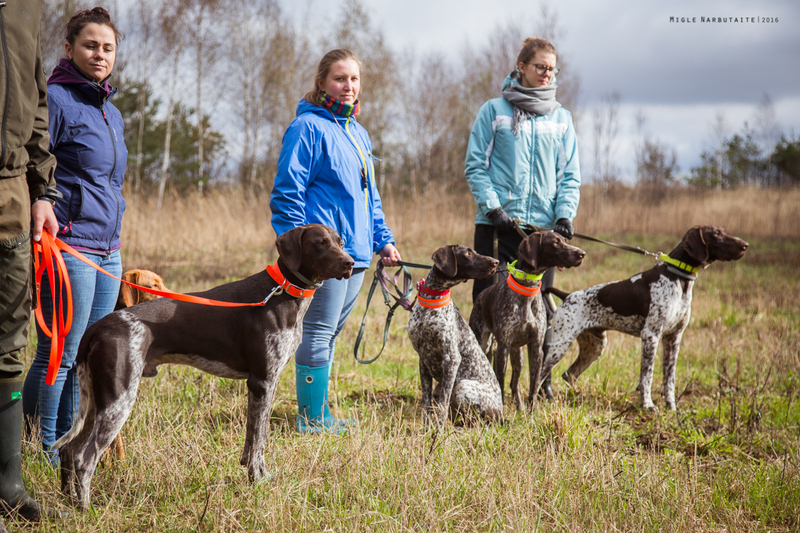 These training tips apply mostly to gun dog puppy training, but also can be successfully practiced with an adult dog. 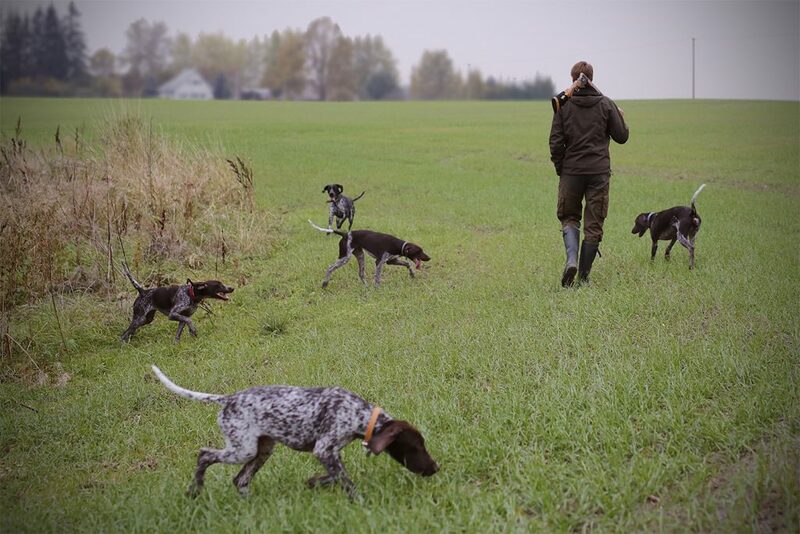 Event the best hunting dogs were puppies in the beginning. 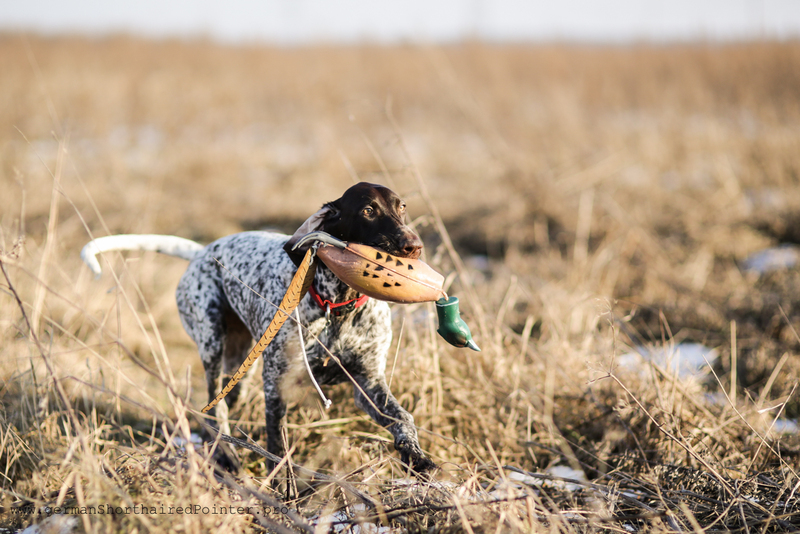 If you already have hunting dog puppies or plan to have them soon, this article is for you. 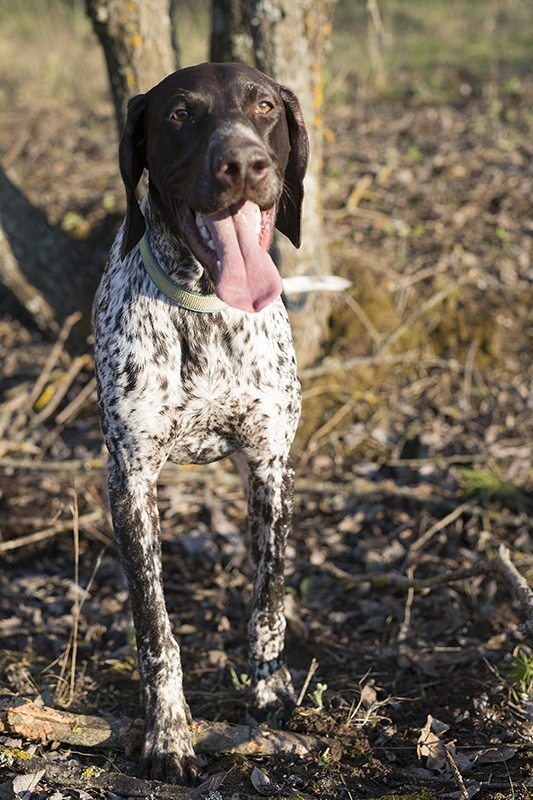 If you already have hunting dog puppies or plan to have them soon, this article is for you. Start with a group of experienced dogs (at least two adults) in a wild field far from the road. At the time of arrival, all dogs must be kept on the leash. The release will be only after the gunfire sound. Let the dogs sit and hold their collars. Be ready to let them run at the right time. People with dogs must stand close to each other or in a small circle. Somebody is having a dummy or a toy, that is very favorite by the pup which is being trained. A person with the gun walks about 100 meters (~ 300 ft) away and shoots. Just after the gun has been fired, the dummy or toy should be thrown in front of the puppy and only the puppy must be released at that time. Within seconds, all the adults should be released as well. The aim is to let the pup catch the toy first and run as a winner just after the shot. If the puppy doesn’t react to the toy and seems confused, let the adults run anyway. Some of them will grab the toy and all will be running together playing. So, the pup will see that nobody is stressed but having fun instead. If the pup tries to find the eye contact with people, don’t look at it. Keep playing a retrieve-throw game with adults. Repeat the whole process (starting from the shot) two more times only if the pup was feeling totally comfortable after the first shot. Do it a few more times withing the next several days again. If the puppy was panicking, looking for the place to hide and the stress release took long, repeat the whole process only after a few days or a week. Don’t forget to change places during the training process. It would be the best to have at least one adult dog with you, who has no fear of loud sounds and is a very joyful player. Take the dogs to the wild field were there is a possibility to find some birds. Wait for 15 – 20 minutes till dogs will get excited searching around or just playing and then make the fire 100 meters (~ 300 ft) away from dogs. Ideally, when dogs will be chasing a bird. A less favorable situation is when you have no possibility to have an adult dog with you. In this situation try to make the trained dog very excited by playing with you and his favorite toy. Let it be 100% in the moment. The shot must be made ~100 meters (~ 300 meters) away. Throw the toy at the exact moment of making a shot. This is very important. Communicate to the person with a gun via phone or a walkie-talkie to do the perfect timing. After the shot has been made, observe puppy’s reaction but act as nothing happened and keep playing. If the puppy is having fun at the time of loud artificial noise, they will be more likely to create positive associations than a stressful feeling. Once you’re sure the pup is accustomed to the fire sound, you can start moving a little closer (20 meters / ~ 60 ft) until you can fire the shot right by the dog without scarring it. 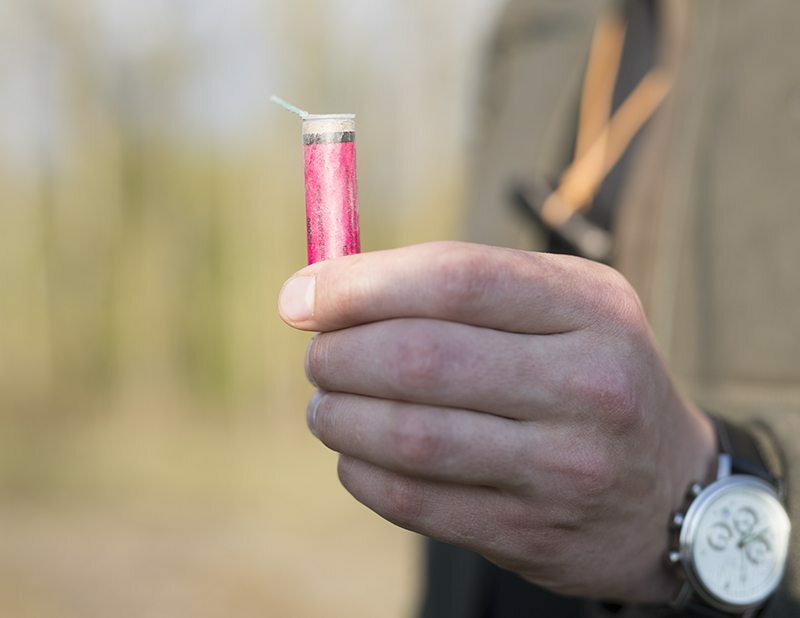 Increase the loudness of shots by using larger caliber shells. Every time you start practicing with a louder shot, start 100 meters (~ 300 ft) away from the dog and move towards it gradually. If the pup still has gun shyness, or you think that you might have pushed the process too fast, go back working with the group of adult dogs. Experienced adult dogs will help rebuilding puppy’s confidence. There is a number of mistakes that can ruin your efforts to correctly train your dog. If you rush in training, the pup might become shotgun sound shy or nervous around other loud noises as well. Unlike other undesirable behaviors, particular this one is not something that you can easily correct. Never fire a gun near the dog just to see if it’s sound shy. Usually, a gun shy dog is not such because of his genetics. It often stems from bad training or poor socialization. Never allow your dog to be exposed to fireworks before he is trained to handle the gunshots well. Fireworks are sounds that make dogs go crazy quite often. Never take your pup to a shooting area before he is trained. Many people believe, that throwing a dog into the stressful situation will make it acclimatize faster. In reality, the opposite happens – dogs become traumatized. Do not take the pup / dog hunting before introducing it to the gunfire. Never take your dog to any party or places where fireworks will be used. If you don’t have a gun and don’t know anyone who may have one, there is an option to perform training anyways. Use a petard / firecracker. When buying a petard, ask for the one which explodes similarly to the sound of a gun. It must be only one sudden explosion sound with no additional sounds like whistling or multiple explosions. Gunfire training is an ongoing experience. Every time you learn something new and improve current abilities of your dog and yourself. 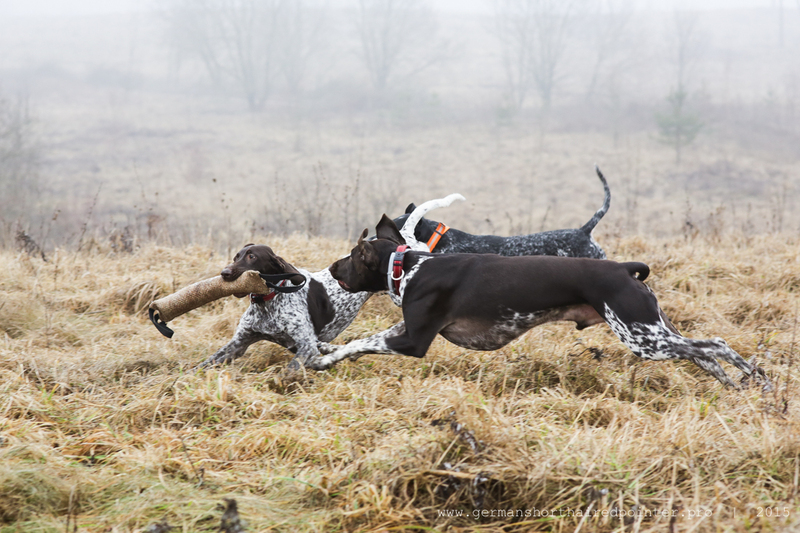 You will learn how to train hunting dogs only while training them. Simple as that. Take it slow in the early stages. Stay aware of your dog’s reactions and overall behavior and correct it when needed. If your dog is afraid of the fireworks or has a fear of thunder, this kind of training may also help to ease the dog’s anxiety. People sometimes tell me: “my dog is scared of thunder” or “why are dogs afraid of fireworks?”. I then give them these tips and usually the situation improves dramatically. 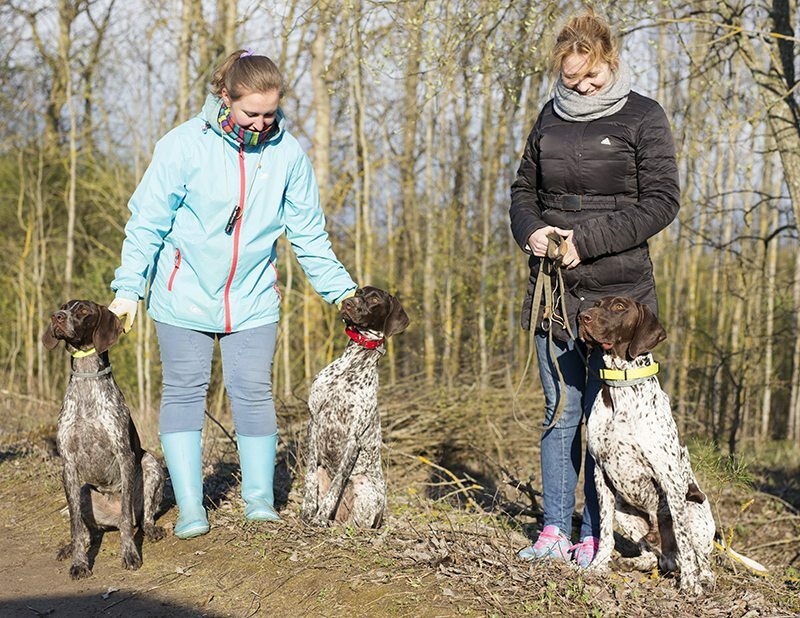 I believe, these gun dog training tips will help you make your first steps towards building your dog’s confidence. I wish you good luck and perfect results! All pictures are copyrighted by us. Not allowed to copy and use without our permission.